Welcome to our World of Warcraft encounter guide for Kil'jaeden in Tomb of Sargeras. We will teach you everything you need to know to defeat the boss in every difficulty. The other pages of our Kil'jaeden guide can be accessed from the table of contents on the right. Since striking the bargain that chased the draenei into the stars, Kil'jaeden believed the Legion could not be stopped. Yet, none of his deceptions have prevented you from reaching this critical moment. Infuriated that Sargeras' promise of victory has never come to pass, the demon lord prepares to face you himself, for a final battle that will shape Azeroth's destiny forever. Kil'jaeden is a 5-phase encounter, sporting 3 main phases and 2 intermissions. The fight takes place on his Legion command ship and becomes progressively more difficult as the fight continues. Throughout the battle, the ship will make its way towards Argus, the main base of operations of the Legion itself. This is a true "final boss"; complex and multifaceted, with extraordinarily punishing mechanical and numbers checks, Kil'jaeden is the ultimate test of coordination and skill for raid groups to conquer. Perform a taunt swap when Felclaws reaches 5+ stacks. On Heroic and above tanks must also keep Kil'jaeden faced away from other raid members at all times to avoid the frontal cleave. Intercept Armageddon Hail, the largest missile, when Armageddon is being cast. Heal the Hopeless Reflections to minimize the damage the raid receives from Hopelessness. Be ready to heal through Armageddon Blast if a meteor is missed by the raid. Have appropriate raid healing ready for Erupting Reflections and their casts of Erupting Dreadflame. Spot heal recipients of Bursting Dreadflame and be ready with cooldowns (if necessary) for Focused Dreadflame. Ensure the raid is healthy for Rupturing Singularity. Be careful not to expend excess Mana during Choking Shadow, but ensure none of the raid is killed by Destabilized Shadowsoul and Illidan's Sightless Gaze. Be ready to surgically heal anyone hit by Demonic Obelisk. Have raid healing ready during Darkness of a Thousand Souls to ensure no one dies from Gravity Squeeze. Spot heal the recipients of Flaming Orb to ensure that the Flaming Detonation does not cause lethal damage. Eliminate all Reflections as fast as possible. Eliminate all Shadowsouls as fast as possible. Stand close to Rupturing Singularity without being inside of the effect to avoid being knocked off the platform. Take turns soaking Armageddon Rain to avoid reaching 2 stacks of the debuff (unless you are able to remove the debuff through immunities such as Cloak of Shadows). Ensure none of these meteors land to avoid deaths to Armageddon Blast. Ensure no allies are within 15 yards if you are afflicted by the Bursting Dreadflame debuff. Stack in a line to split the damage received from Focused Dreadflame. On Heroic and higher this also triggers a Focused Dreadburst, preventing any soaking players from being within 5 yards of each other while soaking without risking death. Stack inside Tear Rift when Darkness of a Thousand Souls is being cast to avoid being killed. Kite Flaming Orbs to the far reaches of the arena to minimize the size of the Flaming Detonation. Positioning is the key element to success on this encounter. Being caught out of place at the wrong time will spell doom for the entire raid group. Stay behind the boss at all times on Heroic difficulty or higher unless you are the active tank. Assign 3-5 players to each corner of the room to soak Armageddon Rain. Stack near Rupturing Singularity when it spawns in the center to avoid being knocked off the platform. The inactive tank should soak Armageddon Hail, or a player with Physical damage immunities. Loosely spread in the center, allowing you to quickly fan out for Bursting Dreadflame. Continue to soak Armageddon as in Phase One. 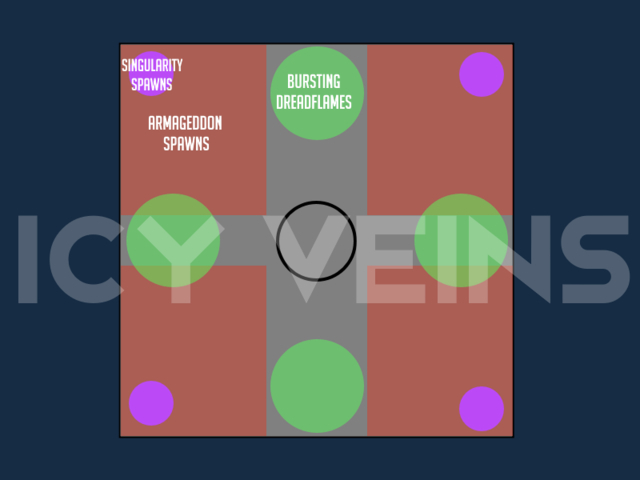 Rupturing Singularity now spawns at the corners of the platform instead of the center. Ensure the damage from Focused Dreadflame is split by at least 6 people. On Heroic and higher each player must be at least 5 yards apart to avoid splash damage from Focused Dreadburst. The third phase is similar to Phase One, however, you will know need to deal with Bursting Dreadflame and Focused Dreadflame, which are handled in the same fashion as in Phase Two. Phase Four, and the second intermission, is quite unique. The raid is blanketed by Deceiver's Veil. The raid should find Lord Illidan Stormrage as quickly as possible and receive Illidan's Sightless Gaze. When you receive the sightless gaze debuff, kill all Shadowsouls as quickly as possible. Once all of the adds are killed the final Phase begins. The final phase features the Bursting Dreadflame, Focused Dreadflame, and Felclaws mechanics found in Phases One, Two, and Three. The big mechanic of this phase is Darkness of a Thousand Souls, which will kill any players hit that are not affected by Tear Rift. To counter this, the entire raid must stand in the active rift (which spawn in corners of the room) by the time the cast ends. Flaming Orbs will also spawn and chase players. These must be taken to the edges of the room as they will leave fire pools behind, which are reduced in size based on length of time the orb has traveled. We advise you to use Bloodlust/ Heroism/ Time Warp in the final phase, as this is the longest and most punishing part of the fight. Raid damage throughout this phase is also quite high, giving the cooldown dual benefit as a damage and healing cooldown. 11 Sep. 2017 (mythic page): Page added. 20 Jun. 2017 (this page): Guide added.